The Adélie penguins might not be the most popular of the penguins, but they sure are great swimmers. Like all other species of penguins they are flightless – but, oh boy, they can swim! When they’re in the water it is almost as if they’re flying. They can reach speeds of up to 45 miles per hour. This makes them one of the fastest swimming species among penguins. Think about this for a second: the fastest that a human being can run is about 25 miles per hour and that is one of the top runners in the world. 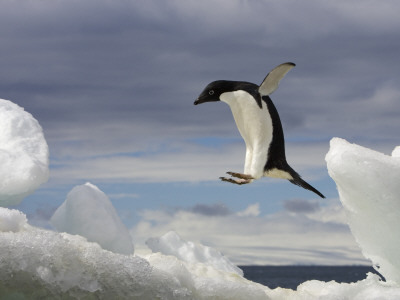 Adélie Penguins can swim almost twice as fast as Olympic athletes can run! They don’t just swim fast for fun though. Swimming helps Adélie Penguins survive. Most of their food lives in the ocean and they have to be fast enough to catch it! Small shrimplike animals called krill are their main source of food and sometimes an Adélie will catch fish or squid as a treat. Powerful webbed feet and wings that act as flippers propel these penguins through the water at breakneck speeds. Their torpedo shaped bodies help them cut and slice through the ocean with little resistance. These physical characteristics have evolved over time to make Adélie Penguins the best swimmers possible and help in their survival. Hollow bones filled with air are commonplace among birds. The light bones make flying much easier. But penguins can’t fly. Their bones are much denser and without all of that empty airspace. The additional weight from their bones helps them stay underwater for longer periods of time. They are kind of like the weighted diving belts that human divers sometimes wear to keep themselves from floating to the surface of the ocean while diving. Adélie Penguins can stay underwater for up to fifteen minutes. It gets very cold in Antarctica where penguins live. The land is cold, but in the water it is even colder. Since Adélie Penguins spend up to 75% of their time in the water they need a way to keep their bodies from freezing. A very thick layer of skin with a lot of blubber (fat) underneath keeps them warm. This combined with their swimming help them keep their body temperature up. 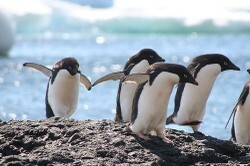 Sometimes when it is very cold Adélie Penguins have to stay on land and huddle together in groups with their friends. and its penguins named after his wife "Adélie"
See how fast these penguins can go? Adélie Penguins can swim twice as fast as Olympic runners and over five times as fast as Olympic swimmers. Next time you’re driving on the highway, take a look out of the window when you’re going 45 mph – that’s how fast an Adélie swims. Their swimming ability has been perfected over millions of years to help them catch their dinner and avoid predators. I'm a bird lover. Do you live where Penguins are? Thanks for this article. Wow, cute penguins and some very interesting info. Congratulations on getting Editor's Choice - well deserved. I just love Penguins. Thanks for such an interesting and informative page! What a lovely penguin page!